On May 5, New England Boatworks (NEB) hosted a group of environmental leaders who travelled to this Portsmouth (R.I.) facility to applaud NEB for becoming the largest Clean Marina in Rhode Island. But these leaders also joined at the waterfront to discuss how public- and private-sector efforts are working together toward a common goal: the preservation of the marine coastal environment in the Ocean State. 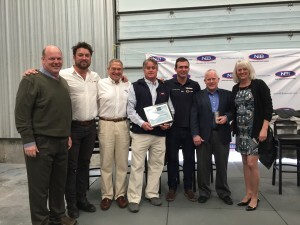 During the ceremony, the Clean Marina award was presented to NEB Owner Tom Rich by Grover Fugate, executive director of the RI Coastal Resources Management Council (CRMC). 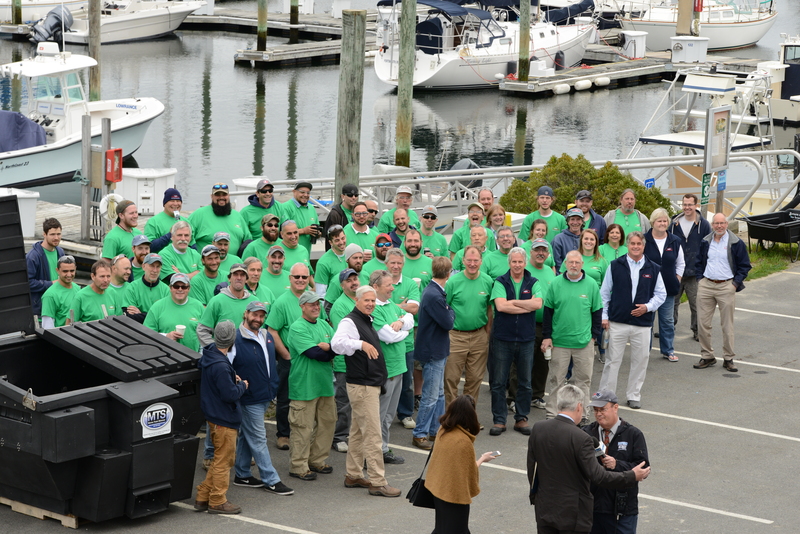 The CRMC is the state’s coastal management agency, and it coordinates the Clean Marina Program–a voluntary initiative designed to reward marinas in Rhode Island that go beyond regulatory requirements by applying innovative, pollution-prevention practices to their daily operations. U.S. Senator Sheldon Whitehouse, Team Vestas 11th Hour Racing Skipper Charlie Enright, R.I. Department of Environmental Management Director Janet Coit, 11th Hour Racing Strategic Director and Co-Founder Jeremy Pochman, an d Clean Ocean Access Executive Director Dave McLaughlin spoke at the event. Dennis Nixon, director of Rhode Island Sea Grant, was emcee. The entire NEB staff also donned green shirts and took a break from their busy springtime schedule to join the ceremony. Team Vestas 11th Hour Racing Skipper Charlie Enright, who grew up only five miles from NEB, has sailed around the globe in the Volvo Ocean Race and has seen the depth of the marine-debris problem and its impact on marine life. By competing in the next Volvo Ocean Race, which begins in Spain in October 2017, Enright and his crew have a perfect platform to tell race-followers around the world about the importance of building a more sustainable future. According to Dennis Nixon of R.I. Sea Grant, the efforts made in Rhode Island have made the waters surrounding this state cleaner and clearer than they have been in a century. Although there are now 24 states and many countries that have Clean Marina programs, the Ocean State and its boating industry started the inquiry about marinas and their coastal environment over 40 years ago. With many marinas built on the bones of old commercial shipyards, the Rhode Island Marine Trades Association (RIMTA) approached R.I. Sea Grant in the early 1970s about studying the relationship between marinas and the coastal environment. A second study done in Rhode Island in 1978 (The Environmental Impacts of Marinas and their Boats, by G.L. Chmura and N.W. Ross) furthered the discussion before Clean Marinas become a movement in the 1990s. New England Boatworks is Rhode Island’s fifth and largest Clean Marina—and both its size and diversity make earning this designation a commendable achievement. The facility spans 28.75 acres of land and 8.5 acres of boat basin and includes a boat-building division that produces custom, state-of-the-art sail and power yachts; a full-service marina that offers long-term and transient berths for yachts alng with complete refit and repair services; and a haul-out, storage, and service facility. ABOUT NEW ENGLAND BOATWORKS: The roots of New England Boatworks (NEB) reach back into the days when aluminum 12-Meters competed for the America’s Cup. Three young boat-builders–Tom Rich, Steve Casella and David MacBain, who are NEB’s present-day partners—had honed their skills building 12-Meters, IOR race boats, and performance cruisers. In 1988, they gathered ten of the best hands-on experts in the business and struck out on their own to start a new company. Soon, the demand for NEB-built boats took hold and the company expanded from their rented facilities to ownership of East Passage Yachting Center in Portsmouth. Today, NEB spans 28.75 acres of land and 8.5 acres of boat basin and includes a boat-building division that produces custom, state-of-the-art sail and power yachts; a full-service marina that offers long-term and transient berths for yachts along with complete refit and repair services; and a haul-out, storage, and service facility. To learn more about the company, visit www.neboatworks.com. ABOUT THE RI CLEAN MARINA PROGRAM: The Clean Marina Program was developed by the RI Coastal Resources Management Council, along with the RI Marine Trades Association, RI Department of Environmental Management and Save The Bay, to protect the state’s coastal waters and benefit the marina industry in Rhode Island. The program is a voluntary initiative designed to reward marinas that go beyond regulatory requirements by applying innovative, pollution-prevention, best management practices to their day-to-day operations. New England Boatworks is the fifth and largest operation to earn this distinction and the only Clean Marina located on Aquidneck Island. For more information on this program, visit www.crmc.ri.gov/marinas.